In 1868-69 North Carolina's Reconstruction government extended $27.83 million in the form of bonds and stocks to 18 railroad companies in the state. Although it was mainly zeal for internal improvements that accounted for the state's generosity, some of the more extravagant and ill-advised aid measures resulted from the activities of a railroad "ring" operating primarily through the Republican-controlled General Assembly. The ringleaders were lobbyist Milton S. Littlefield, a suave transplanted northerner, and George W. Swepson, an erstwhile North Carolina banker. Swepson had gained the confidence of Republican governor William W. Holden, who foolishly believed that tax revenues would be adequate to meet the interest on the bonds. By 1870 the bond market had virtually collapsed, leaving North Carolina with a heavy debt and few new railroad miles to show for it. With the state's credit standing deteriorating, both reform Republicans and Conservatives (Democrats) in the General Assembly demanded an investigation of the railroad scandal. The Senate appointed a three-member investigating committee headed by former governor Thomas Bragg, a respected Conservative. Influenced by Holden, who believed that the fraud charges were politically motivated, Republicans in the Senate limited the scope of the committee's work and thus prevented a thorough inquiry into the scandal. The Bragg Committee did reveal the need for an extended, unrestricted investigation of the charges. When the Conservatives assumed power later in 1870, they appointed a committee known as the Shipp Commission, which subsequently uncovered numerous incidents of fraud and bribery-some involving Conservatives-in the issuance of railroad bonds and stocks. Neither Swepson nor Littlefield, the chief perpetrators of the corruption, were brought to justice. Charles L. Price, "Railroads and Reconstruction in North Carolina, 1865-1871" (Ph.D. diss., UNC-Chapel Hill, 1959). "The Case Of Milton S. Littlefield." The New York Times. July 29, 1879. http://select.nytimes.com/gst/abstract.html?res=F20616FA345B137B93CBAB178CD85F4D8784F9 (accessed October 15, 2012). "An Act Creating a Commission To Inquire into Charges of Corruption and Fraud." Public laws of the State of North-Carolina, passed by the General Assembly at its Sessoion 1870-1871. 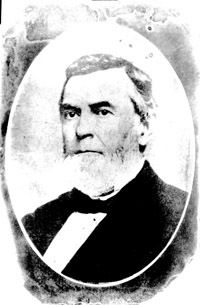 Raleigh: James H. Moore. 1871. p.119. http://digital.ncdcr.gov/u?/p249901coll22,180027 (accessed October 15, 2012). Assembly, Session 1871-72. Raleigh: J. H. Moore. 1872. http://archive.org/details/reportofcommissi00nort (accessed October 15, 2012). "The Bragg Committee Investigation-Profligacy and Corruption." The Greensboro Patriot. May 5, 1870. http://libcdm1.uncg.edu/cdm/ref/collection/GSOPatriot/id/9536 (accessed October 15, 2012). Daniels, Jonathan. Prince of Carpetbaggers. Philadelphia: J.P. Lippincott. 1958. "Thomas Bragg." Photograph no. 53.15.1559. From the Audio Visual and Iconographics Collection, Division of Archives and History Photograph Collection, State Archives of North Carolina, Raleigh, NC, USA.